of the strong beauty trends this year is going to be the emergence of brands that merge together traditions of different countries and Valia skincare comes to mind as a good example, fusing ancient Japanese traditions with advances and practicalities of America. At the core of this skincare brand lies the celebration of individuality and natural ingredients derived from proprietary blend of grains, herbs, botanicals, essential oils and Japanese remedies that help to enhance and embrace who you truly are-a unique person who has something to give to this world. The brand was found by the husband and wife team, Mario Kimball and Tatako Niwa. While living in Japan Mario discovered not just the rich culture and delicious and healthy food, but he fell in love with the language and traditions of that beautiful country, as well as found his soul-mate in Tatako. To this day Mario and Tatako are inspired by Japanese tea ceremony, the art of putting a kimono, nurturing & creative process of growing a bonsai tree, as well as the art form of calligraphy. Valia team ( which also includes Japanese herbalist Marc Ching ) believes that enduring beauty occurs when our skin is allowed to blossom, instead of being covered by too many products and make-up and draws further inspiration from the notion that every one of us has the potential for beautiful and luminous skin at any age. Theirs is the range that currently consists of a cleansing milk ( suitable for blemish/normal/dry skin ), purifying wash ( blemish prone skin/all skin types ), Yuzu hydrating cream that can be used both day and night ( all skin types, including blemish prone skin ), Bloom ( a supplement with anti-ageing and fat-metabolizing properties ) and an essential travel kit. There are plans to add more products to Valia range, which will help enhance health and beauty of your skin. Even though valia skincare hasn’t as yet got a UK stockist, they were kind enough to send me three of their core, travel-sized products and I felt like I got immersed in a special bubble. It also never ceases to amaze me that many large and established brands are very petty when it comes to giving customers samples ( so a customer can try the product before deciding if the product works for their skin and commits to purchase ) while smaller brands would send/give you samples or products to try, when it is costly to them ( and that is even before you consider postage costs from abroad ). It instantly endears the brand and its team to you and makes you curious to try the skincare range. Valia Purifying Wash: this gel-like formula smells slightly flowery and almost instantly refreshes your skin. Start by moistening your face with luke-warm water and then massage one or two pumps of the product all over your face, inhaling its uplifting aroma. As your wash your face, the purifying wash turns into a light lather, which gently shifts away make-up and daily grime. By the time you wash it off and towel dry your face, you will feel like a newer, cleaner person. This Purifying Wash is made from plant-based ingredients, herbal extracts and essential oils such as Green Tea, Aloe Vera Leaf Juice ( good for cleansing and purifying of the skin, it also has moisturising properties. Women are often recommended to take Aloe Vera juice by holistic health practitioners because it contains 19 out of 20 essential amino acids and helps to purify our skin ), Papain Enzyme ( derived from the fruit of papaya tree it helps to break down harmful proteins within the skin matrix and encourages healthy cell turnover ), Vitamin C and Yuzu that encourages cell turnover, protects its structure and makes your skin look more radiant. If you like a light cleanser that won’t strip your skin, instead leaving it feeling hydrated, then I would definitely recommend you give it a try ( I have used it in winter and find that is feels particularly lovely when used in the morning ). Valia Cleansing Milk: this cleansing milk is quite different from the ones I have tried before, as it is a mix of milkiness and gel-like texture which feels very light when you apply it to your skin, yet has a creaminess to it that helps to shift make-up and pollution build-up in the evening. It has a slightly stronger smell than purifying wash but it is always nice for each product in the range to have its own, marked identity. The application technique is the same as with the purifying wash but I definitely prefer to use this one in the evening, somehow feeling that it has a more potent formula to melt the stresses of the day away. It clarifies the skin and fuses herbal extracts, plant-based ingredients and essential oils such as Aloe Vera, Bromelain ( Pineapple ) and Coconut Oil. The essential ingredient here is Rice Bran Oil which is known for its ability to refine, brighten and encourage cell turnover. Rice has been called the essence of the Japanese culture and rice bran oil which is derived from whole rice grains has been used by Japanese women to help them maintain smooth, porcelain-like complexion ( it blocks melanin production in the skin but also acts as sunscreen when exposed to direct sunlight ). Another ingredient, across which I never came before, is called Job’s Tears. According to Valia’s website it is responsible for boosting immunity and combating impurities in the blood, hence in Japan it is used to treat skin allergies, dermatitis, acne and eczema by reducing the inflammation process. According to Valia, this cleansing milk can help people with acne or eczema prone skin as it supports the reduction of oil build up, which in turn can lead to clogged pores and the slowing down of the cell turnover process. Ingredients: (Aqua (Water), Decyl Glucoside, Caprylic/Capric Triglyceride, Glycerin. Prunus Amygdalus Dulcis (Sweet Almond) Oil, Cocos Nucifera (Coconut) Oil – Saponified, Stearic Acid, Cetearyl Alcohol, Cetearyl Glucoside, Gluconolactone, Sodium Hyaluronate, Coco-Glucoside, Glyceryl Oleate, Aloe Barbadensis (Aloe Vera) Leaf Juice, Coix Lacryma-Jobi Ma-yuen Seed Extract (Hato Mugi/Job’s Tears/Pearl Barley), Glycyrrhiza Glabra (Licorice) Root Extract, Oryza Sativa (Rice) Bran Oil, Camellia Oleifera (Green Tea) Seed Oil, Xanthan Gum, Pectin, Stearyl Alcohol, Butyrospermum Parkii (Shea) Butter, Citrus Junos (Yuzu) Peel Oil, Squalene, Papain (Papaya), Bromelain (Pineapple), Tocopherol, Niacinamide, Magnesium Ascorbyl Phosphate, Sodium Benzoate. Valia Yuzu Hydrating Creme: what surprised me when I first applied this cream was how light it was. It looks like yogurt and yet you apply it to your face and you skin seems to drink it in before your eyes. With citrussy notes it delights the senses in the morning and creates a good canvas for make-up application ( make sure you use liquid, not mineral make-up alongside it; if you tend to favour the latter, make sure you apply the primer first ). This cream contains Aloe Vera, Sweet Almond Oil and Hato Mugi/Job’s Tears/Pearl Barley that replenish and restore your skin’s moisture levels, while improving elasticity. More importantly this creme contains Valia’s star ingredient, Yuzu fruit, which tastes like a fusion of orange, mandarin and lemon and is known for its powerful anti-aging & antioxidant properties. Add to it brightening Vitamin C and Alpha Hydroxy Acid and you have a formula that increases collagen production and fights free radical damage. According to Valia website, Japanese people have used the refreshing essence of the yuzu from ancient times, in order to submerge fully in rejuvenating “Yuzu-yu” baths. The Yuzu’s oil “Nomilin” is known for relaxing the body and improving the circulation. It is believed the Yuzu bath brings wealth, good health, and helps to fight off winter colds and flu. GAP: Why did you choose the name Valia for your brand? MT: ‘Valia’ mean ‘protecting the skin barrier’ in Japanese. GAP: How long did it take to formulate the products and what was your aim when creating your skincare brand? MT: It took years to formulate the products, as our main goal was to combine natural ingredients that work to help the skin heal itself. GAP: At the core of your brand lies the celebration of individuality-why is it so important to you? MT: Everyone is different, so we embrace our customers for who they are. GAP: What makes the approach to beauty in Japan different to beauty approach in the USA? How do you manage to fuse those two different cultures successfully in your skincare? MT: From our experience, America goes with what can get you to your goal ASAP, sometimes that means using the most effective resource. With Japan, we try to keep the old traditions and ingredients, recapping what generations used before. As an example, Rice can enhance beauty, hence we want to use rice as naturally as we can in as many ways. GAP: Tell me a little bit about Wabi Sabi and why it lies at the core of Valia skincare? MT: It’s a core point in Japan, which has many, many meanings behind it. For us, it’s the raw of being natural, embracing ageing and not hiding it. There is no such thing as anti-aging, so we never use this term. Helping the skin achieve a natural, healthy balance is what we strive for. GAP: Valia is a three step beauty system-does it mean that you believe in the simplicity of beauty? What does beauty mean to you? MT: Subtle acknowledgement, devolving into grace. GAP: Tell me a little bit about each of Valia products and its unique qualities. MT: Yuzu is refreshing and a brightening, so we use it in all of our products. Purifying daily facial wash is formulated to remove make-up and pore-clogging debris, while preserving the skin’s natural barrier. Natural vitamins and antioxidants in it help to energize the skin and remove impurities. Even the most sensitive skin will feel refreshed and soft after use. Cleansing Milk helps to stop blemishes before they make an appearance by targeting and removing over 99% of dirt and oil that can cause them, so you are left with clear skin. Yuzu Hydrating Crème is enriched with natural Yuzu, Papain, Camellia, and Green Tea. It is deeply hydrating and quick to absorb, leaving sensitive or distressed skin instantly smooth and refreshed. It is made with Natural Fruit Enzymes and is rich in vitamins A, E & F which are essential for maintaining good skin balance. 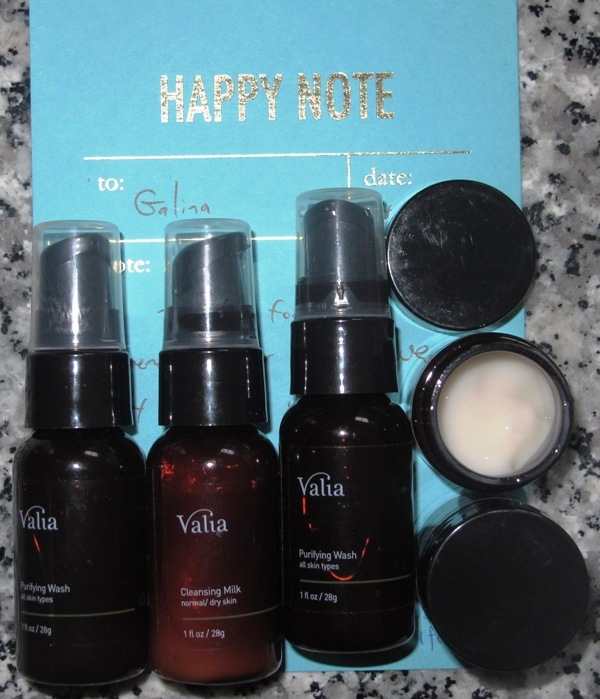 GAP: What are the ‘star’ ingredients of Valia skincare products and why did you choose them? MT: Yuzu Passion is infused with Vitamin C, we use this exotic citrus fruit in our Skin Care Series. Yuzu helps to rejuvenate maturing skin through its rich source of antioxidants. Rice Bran Oil, known as the essence of Japanese culture, is made from whole rice grains and can help skin stay smooth, moisturized and healthy. It contains proanthrocyanidins, which protect collagen and elastin, as well as gamma oryzanol, an antioxidant that fights free radicals. Also rich in Vitamins B and E, Rice Bran Oil helps brighten skin by blocking melanin pigmentation. Many Japanese people believe aspects of Japanese social behaviour, such as the notion of “wa” (harmony), came from wet rice cultivation. This labour-intensive task required people to work together and share water. Papain Enzyme has a low sodium salt content and helps break down harmful proteins in the skin, encouraging cell turnover and creating younger looking skin. It gently exfoliates, making pores seem smaller and giving skin a refined, supple look. Papain Enzyme is also rich in antioxidants, such as Vitamin C, flavonoid and carotenes that help remove dead skin cells and clear impurities. The alpha hydroxy acid (AHA) in Papain aids in exfoliating the skin and is a natural, plant-based alternative to chemical exfoliates. These enzymes encourage skin renewal and have restorative properties that can help soften the skin and give it a smoother appearance. Papain also works to block free radical damage caused by the environment. Free radicals are unpaired molecules found in UV rays and pollution that cause premature aging such as fine lines, wrinkles and age spots. GAP: You have two Valia cleansers, what is the difference between them? MT: Purifying wash is for daily use and is most suitable for normal skin. Milk cleanser is more tailored for dry, problematic skin. GAP: How important is diet and nutrition to the overall skin health? MT: The beauty of the skin can be affected from both inside and out. What you eat and drink really has an impact on how your skin looks. Green tea ( drunk hot or cold ) is great, and if you can eat more foods in their ‘natural’ state, like seafood, your skin will thank you for it, as such food is healthier for the body and easier to digest. GAP: Can you share some of your beauty & nutritional secrets? MT: Generally, Asian food is healthier than American food. Japanese people eat less butter and beef, but more rice/noodles and drink lots of Oolong and green teas. We tend to favour Asian /Japanese, Thai, Vietnamese and Korean food but having a burger sometimes never hurts. GAP: You and Takako are not just husband and wife but business partners as well-what’s the secret to a successful beauty partnership? How do you divide the responsibilities? MT: We are honest with each other. We sit down and work out the strong and weak points. If both of us are both weak at something, we bring in a person that’s strong in that area. GAP: Marc Ching, a herbalist, is part of Valia team. What role does he play and what’s his view on skincare products? MT: He oversaw/oversees all supplement development and has input/suggestions on skincare. He is a big help to our team. GAP: What part does holistic medicine practises play in Valia skincare? MT: We try to keep everything natural. GAP: What are Valia’s plans for 2014 ? MT: We have nine new products in development, hopefully we’ll have a least four of the products officially launched by the end of the year. We are planning to be in at least three retail stores and have bigger brand awareness. For more information on Valia Skincare, go to their informative website and online store.